For the UK Elections it doesn't seem that that anyone has bothered to create a real-time Google Map to show the results as they come in. 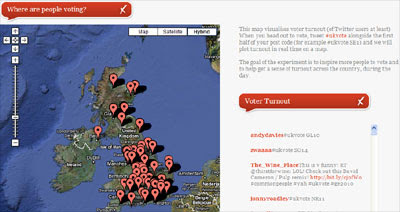 Instead we have Tweetminster's Voter Turnout Map. To add yourself to the map tweet #ukvote alongside the first half of your post code (for example #ukvote SE1) and your turnout will be plotted in real-time on a Google Map. You can also view the Voter Turnout map on The Guardian's website.